Did you catch Taylor Gourmet featured in the September issue of Dwell magazine? The story highlights the rustic industrial look of the renovated building on H Street NE that houses not only the Italian deli but also owners Casey Patten and David Mazza. They built nearly identical apartments on the two floors over the market. (Later this year, they're planning to open a second Taylor in the CityVista building at Fifth and K Streets NW.) Check out the salvaged materials and resourceful design in the slideshow here. 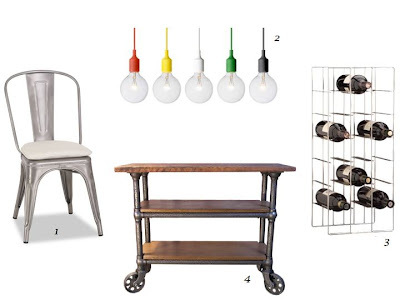 Savory Style was inspired by Patten and Mazza's industrial chic aesthetic with this round-up. Savory Style is an occasional weekend feature highlighting great style and cool products for your kitchen, tabletop and home.